Chilliwack – Pioneer Village Museum is more than just a place where everything old is new again. A popular destination for car shows, weddings, birthdays, school and senior tours as well as part of the Chilliwack Fair, it’s equal parts community and opportunity – a chance to move forward while stepping back in time. Powered by volunteers and open to the public, PVM opens a lot of doors to its members, including free use of its mechanical shop, woodworking shop, blacksmith shop, and extensive library. “When I’m working around here it feels like my hometown,” says five-year member Bill Priestley. Flicking a worn switch, Priestley zaps his milk-jug sidecar to life. Horn blaring, his electric train rounds the corner as silver tubs rattle into place. Across the small gravel road from a restored tractor buried halfway into the kids’ playground, his trains are housed in one of many small buildings throughout the 7km stretch of PVM grounds. Members running the site pay $35 annually to belong to the governing Atchelitz Threshermen’s Association. Harv McCullough isn’t a member of the ATA, but that’s not to say he isn’t a fan. Sitting at a picnic table outside Granma’s Grill, McCullough recalls discovering the Village at meetings for his classic car club. “This place is a real diamond in the rough,” he says. You might even find some Hollywood fixtures. The Village’s extensive vehicles and farm machines are popular pieces for period films. They range from a 1907 horse-drawn hearse to a 1926 Hudson, Woodward’s delivery truck, and a lovingly restored Fraser Valley Milk delivery wagon, plus dozens of others. Members adopt cars, tractors, or buildings as their own projects. President Stuart Vander Kooi has his own hand in everything from watering flowers to turning forgotten relics into invaluable museum pieces. “It’s an excellent place for people who might’ve downsized but still want to stay active and choose a project and have a good time,” he says. While the entire property can be considered a museum of sorts, one enormous building on site is designated for specifically that purpose with a recreated 1940s farmhouse setting, Native artifacts, and an old schoolhouse with coal stove, and worn wooden desks with inkwells and fountain pens. And don’t forget to find that equipment used to drain Sumas Lake into viable farmland. Taken from an Aboriginal word meaning ‘meeting place’ the Atchelitz group started as a group of guys wanting to have a threshing bee around 1980. “It’s evolved dramatically,” says Vander Kooi. Part of the Tourism Triangle that attracts tens of thousands of visitors a year – including Heritage Park and the Tourism Chilliwack bureau – the PVM is a registered museum operating entirely on community donations on land leased from the City of Chilliwack. “So few cities have a working community like this,” says Priestley. The grounds and facilities run by the ATA are open year round, including the quaint church and a library operated by a retired North Vancouver librarian. 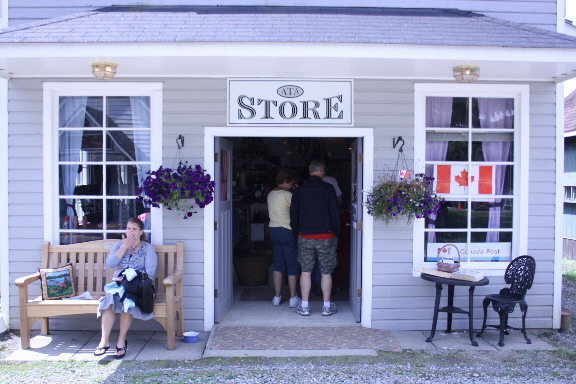 Chilliwack’s Pioneer Village is located off Highway 1 at 44146 Luckakuck Way, and open to the public Monday, Wednesday, Thursday, Friday, and Saturday from 10am-3pm between May to September, and Saturdays from 10am–3pm from October to March. Guided tours are available to schools, seniors clubs, and other organizations. Entry is by donation. For more information, visit atchelitz.ca or call 604-858-2119. Be the first to comment on "A Hidden Gem — Pioneer Village Museum"